HMI VIDEO NEWS EPISODE #14: TI JOE ZENNY. RICHIE. & ARLY LARIVIERE/NU LOOK! (WATCH IT NOW)! HEAVYWEIGHT LINEUP for EPISODE #14 of HMI VIDEO NEWS. 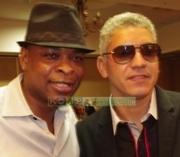 Interviews with TI JOE ZENNY, as well as RICHIE + a performance NEVER BEFORE SEEN ON KM featuring ARLY LARIVIERE & NU LOOK. (WATCH IT NOW)!